Mail Access Monitor is a highly useful application that lets company bosses track the kind of email activity that the employees are indulging in and prevent them from using office resources for personal reasons. The use of Mail Access Monitor is not restricted to preventing employees from using your mailing server for their personal use. It also lets the bosses check whether the employees are doing their job properly. For instance, it is the responsibility of many of the employees to be taking the initiative and contacting possible clients. Through Mail Access Monitor, you can easily see if these employees are showing the required initiative or just sauntering through their working days. It must also be remembered that unnecessary e-mail traffic clogs up your network channels and costs your company extra money. So, this application has the twin advantage of reducing the cost incurred from e-mail traffic while also promoting optimization the human resources meant for increasing sales. Another advantage of this application is it’s ability to let you know whether your target audiences are being pursued well enough. If the number of mails being sent to them is not up to your expectations, then you can talk to your employees and tell them to be more proactive. 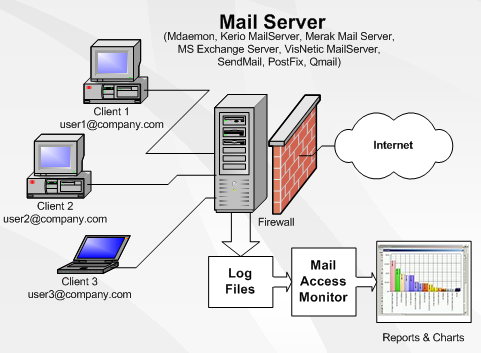 Mail Access Monitor is compatible with most mail servers like Merak Mail Server, VisNetic Mail Server, Send Mail, QMail, PostFix, CommuniGate Pro, MDaemon, Kerio Mail Server, MS Exchange Mail Server, etc. This software, produced by the same company that created Internet Access Monitor, has been employed by some of the top companies in the world including those belonging to the prestigious Fortune 500 club. The knowledge of their e-mail activity being tracked naturally spurs staff members to work harder at communication with clients as well as prevent them from wasteful usage of company’s mail servers. Since Mail Access Monitor is no longer available, it becomes imperative for companies to find good alternatives which can be employed for achieving the same ends. Here is a list of some of the best ones available. This is a highly analytical and detail filled applications that tracks the performance of your e-mail server and network. It uses many metrics for monitoring the activities operating through the server. Through this application you can take remedial measures as well. Unfortunately, while it has great qualities to recommend it like it’s cost-effectiveness and custom settings, it also comes with a few drawbacks. The installation time is much more than would be considered comfortable the process itself is quite complicated. Still, this is a good option if you can learn some complex methods of operation. If you want greater features, you will have to buy the upgraded version called Nagios XI. It has to be made clear right at the outset that this is not a freely available software and you can use it without cost for just a trial period of 30 days. But the services for those 30 days would be quite satisfying if one were to go by the reputation it has generated. It offers comprehensive monitoring for more than 200 applications such as Windows, Linux, Active Directory etc. This application provides various aids for monitoring and controlling email activity. It is also highly useful for measuring the performance of your server. Another very useful monitoring system that works for various servers. Its specialty lies in its ability to monitor and analyse clusters and grids. Using well-known technologies, it presents details about data transport and data representation. It is also highly useful for tasks of engineering data structures as well as data algorithms in order to increase the efficiency of servers. This software is a mainstay of many universities. Though this product is available for just 14 days for free, it is quite useful for the kind of server monitoring and data statistics which are required. It’s considered one of the best SaaS application tools. It is quite clear that Mail Access Monitor was just the right kind of software for the purpose of monitoring mails and a suitable replacement is yet to be found. Still, depending on your exact requirements, there are some products which can help you with the task of server monitoring and do it effectively.